PARENTAL RIGHTS, BEST INTERESTS AND SIGNIFICANT HARMS: WHO SHOULD HAVE THE FINAL SAY OVER A CHILD'S MEDICAL CARE? 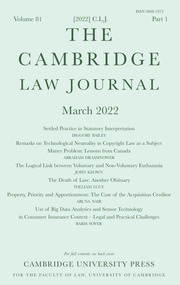 The Cambridge Law Journal is delighted to announce that Professor Lionel Bently has been appointed as Editor in Chief of the CLJ. Professor Bently will replace Professor John Bell when Professor Bell resigns after the completion of the 2019 volume. Two new editors, Dr John Allison and Dr Jamie Glister, will also join the editorial team.